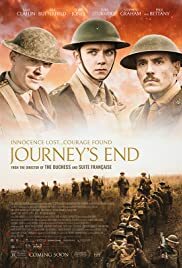 JOURNEY’S END about soldiers (Officers and enlisted men) during an offensive in the trenches during the First World War is a story that is already too familiar to us. Still, it is a story that needs repeating, to remind the world of the futility of war and that orders coming down from the top brass would ultimately be executed often to the death by the men of lower ranks, who has loved ones and families back home. JOURNEY’S END is based on the 1928 play and filmed two years later by James Whale which starred Sir Lawrence Olivier as Cpt. Stanhope now played brilliantly convincingly by Sam Catlin. The updated screenplay be Simon Reade is by no means flawless, (words like a person needing to be sorted’. the word never used at that time; an offbeat change of scenery back to England for the reading of a letter) but serves the fiilm’s purpose. The film begins like any war film. There is news of the war and word of fighting in France against the Germans. Things get real only when the audience can put a face to the goings-on. The face in this case belongs to green 2LT Laleigh (Asa Butterfeld) who wishes to join the battalion of his old school mate Cpt Stanhope who used to be his house monitor and good friend of him and his sister. Stanhope is found to be changed due to the strain of war. 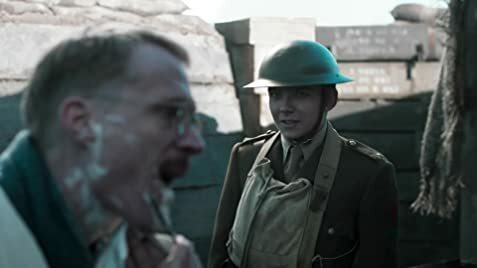 In the trenches are Lta Osborne (Paul Bettany) veteran who is the most stable of the lot and apparentlythe one who keeps everything together. When the men are ordered to attack the Germans in two days time in an effort that seems pointless, casualties increase and things come to a boil in this realities tale of men caught in the war apparently to fight in what they believe for their country. It is made clear at one point, that the assault is to take place at 5 pm so that the higher ups can discuss the results over dinner. Despite the film’s seriousness in tone, Reade’s script is not devoid of needed humour, which is provided by stiff faced Toby Jones as Mason, the men’s cook. If not describing his cutlets as new in shape or the yellowness of the soup to entice the blandness of his meals, the on running jokes on the meals are nothing short of hilarious. The narrow trenches emphasizes the claustrophobia of the location complete with mud rats though only one is shown) and worms oozing out from the mud during a meal. To Dibb’s and the production designer’s credit, the film never feels like a play. Though one might wonder at the film’s aim, it is clear that Dibb’s message is that one is never to forget that human beings are the ones fighting the war, and there are casualties on both sides as the end credits remind both sides of the millions that have died in WWI.